There are several reasons why a person may need reconstructive eye surgery. Perhaps they have suffered a trauma to the eye which has left scarring, disfigurement or a defect, or maybe they have had a tumour removed, have finished their follow-up treatment and are now ready to rebuild the eye structures to try and improve either the function, mechanics or the cosmetic appearance of the eye. Whatever the reason for the surgery, it is important to let patients know that there are options available but equally important is to understand that it may not be possible to return the eye to the same condition it used to be in or that it will be fully functional after the treatment. For may people, the need for reconstructive surgery after the removal of a tumour is not necessary as the surgeon has been able to address the cosmetic issues and retain the function of the eye during the initial procedure. For those with fairly extensive tumours or those who have needed more than one procedure top remove the tumour or surrounding tissues the chances of needing reconstructive surgery are higher, but with the help of a highly trained and experienced professional, the options available to you and the chances of having a good end result are quite high. This type of surgery tends to be more difficult than the previous form as the level of damage varies considerably between patients. For some a small foreign body may need removing or the eye may have been totally affected by a large instrument or debris that has the potential to leave the eye severely affected. It is essential that the patient seeks help immediately after the event and does not attempt to remove any object that has penetrated the eye ball or has pierced the eyelid. This must be carried out under surgical and aseptic conditions to prevent infection from developing and also to minimise the possibility of damaging the eye further when the object is being removed. This can be difficult as a person’s natural reaction is to remove an object if it is stuck, but sometimes this can be more dangerous and do more harm than good. The surgeon will do their best to minimise the chance of scarring after the procedure but their main priority is to preserve the sight and function of the eye and to deal with the cosmetics afterwards; after-all, any scarring can be re-addressed at a later date after the worst of the injury has been treated. It is possible that some of the more common conditions such as an ingrown eyelash may require a certain degree of reconstructive surgery as the nature of the condition can mean that the eyelid begins to naturally turn inwards which will need surgical correction to restore the normal function of the eyelid. It is also possible that the tissues and supportive underlying tendons around the eyelid can lose elasticity and cause the eyelids to droop over the eye and obstruct vision. 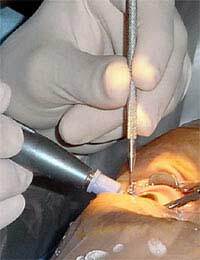 In these cases surgery to minimise the eyelids may be needed. Reconstructive eye and eyelid surgery can be a very important issue for the patient and can mean that for some, a degree of normalcy can be recovered following injury or trauma. I suffered massive trauma to the left eye nearly 2 years ago now. The lense had to be removed, the cornea failed and also had a vitrectomy obviously leaving me with very little functional vision in the eye (mainly shapes and colours) A doctor has suggested I have 3 options, do nothing as the right eye is still fully functional, replace the lens which may give me slight vision back in the eye (he regarded as the safe option) or reconstruct the eye by replacing the lens, iris and new cornea. He seemed enthusiastic about the third option, but said there is a 1 in 5,000 chance that by doing the surgery it could affect the right eye. This is obviously a huge worry for me as I face the decision of what to do. Do I take the risk or be happy that I can still see now with my 'good eye'. Obviously this is a decision a wont make lightly or ask anyone to make for me but just wondered if put in the same position what would you do? Or if there are any professionals read this comment, what would they suggest or can they add anything else for me to consider in making my decision. Thanks! Obviously we can't comment on this ourselves, but hopefully a professional will read this and let their views be known. I suffered massive trauma to the left eye nearly 2 years ago now. The lense had to be removed, the cornea failed and also had a vitrectomy obviously leaving me with very little functional vision in the eye (mainly shapes and colours) A doctor has suggested I have 3 options, do nothing as the right eye is still fully functional, replace the lens which may give me slight vision back in the eye (he regarded as the safe option)or reconstruct the eye by replacing the lens, iris and new cornea. He seemed enthusiastic about the third option, but said there is a 1 in 5,000 chance that by doing the surgery it could affect the right eye. This is obviously a huge worry for me as I face the decision of what to do. Do I take the risk or be happy that I can still see now with my 'good eye'. Obviously this is a decision a wont make lightly or ask anyone to make for me but just wondered if put in the same position what would you do? Or if there are any professionals read this comment, what would they suggest or can they add anything else for me to consider in making my decision. Thanks!